The future of the Voting Rights Act (VRA) in the changed circumstances of the new century was the topic of the 13th annual Black Allied Law Students Association (BALSA) symposium. When the VRA was enacted, in 1965, it presumed a different voting landscape than exists today, and while its purpose—to improve minority voting rights in the United States—is still necessary, the best means of achieving it has changed. 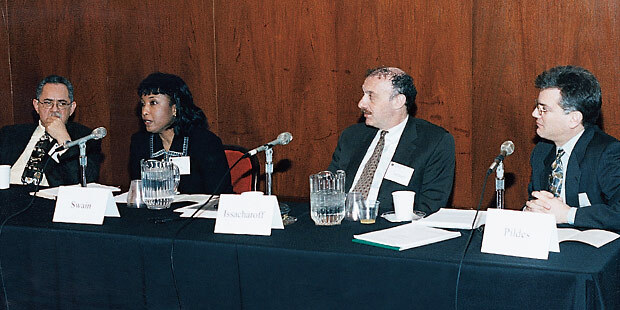 The first panel focused on the VRA, which was designed to give minority groups equal opportunity “to participate in the political process and to elect representatives of their choice.” Professor Samuel Isaacharoff of Columbia Law School (second from right) questioned the continued efficacy of the act. Isaacharoff explained that the act requires redistricting in covered areas to ensure that minority groups can have a representative impact. At the time the VRA was passed, these areas (primarily the South) as a rule did not have any black elected officials, and they were not home to partisan political activity because of the dominance of the Democratic Party. Redistricting changed these conditions. The concentration of minority populations in voting districts allowed Republican players to have a greater presence in the newly created super-majority districts, forcing the Democratic Party to be responsive to the black constituency. Isaacharoff said that it is no longer effective to stack minorities in districts. For example, a recent redistricting movement in New Jersey created many districts that were approximately 40 percent black. This allocation was approved by both the Democratic and black leaders based on the understanding that large minority groups are powerful and can control elections, whereas a super-majority of minority groups will waste minority votes. A similar redistricting plan, however, was struck down in Georgia, a state covered under the VRA. Rodolfo de la Garza, professor of political science at Columbia University, discussed the VRA as it relates to the voting rights of Latinos, who were included as a language group in a 1975 amendment. While concurring that the VRA no longer works effectively in the regions it was designed to impact, de la Garza said that some areas originally outside the act’s scope could benefit from it today, including Massachusetts, which has recently experienced a large influx of Latinos. De la Garza (above, far left) agreed that the unbending regime of the VRA is problematic, but saw a continued need for interventions in the voting system to protect the rights of Latinos. The second panel addressed felony disenfranchisement and its effect on minority, particularly black, voting populations. The first speaker, Jamie Fellner, director of the Human Rights Watch, said that the United States is the only democracy in the world where ex-prisoners are denied the right to vote, which is the case in 12 states. Moreover, in 48 states, inmates are prohibited from voting. In contrast, inmates have the right to vote elsewhere in the Western world and some countries, like Germany, actively encourage them to do so. As a result of the disenfranchisement laws, 3.9 million people in the United States currently do not have the right to vote, about one in 50 adults. There also are significant racial disparities; nationwide, 13 percent of African-American men cannot vote. The average disenfranchisement rate is five times higher for blacks than it is for whites. Fellner asked, “Do the laws serve any purpose, do they work, and are they consistent with human rights?” “No, no, and no,” he answered. These laws also contradict international human rights standards. Disenfranchisement laws do not make distinctions based on the type of crime that was committed, nor do they include any requirement that the crime be related to political activity. Deborah Goldberg, who is now director of the Democracy Program at the Brennan Center for Justice and is engaged in litigation challenging disenfranchisement, discussed the specific actions taken by a national voting rights restoration campaign focusing on Alabama, Florida, Maryland, New York, and Texas. Because the laws regarding felony disenfranchisement differ by jurisdiction, each strategy must be crafted to address a particular situation taking into account whether a state disenfranchises felons permanently, for the duration of their sentence, or for some other period, and whether the law is statutory or embedded in the state’s constitution. A state constitutional provision could be amended, which would call for a public education campaign to garner support for an initiative or other amendment procedure. A federal challenge could be brought against state constitutional provisions. Litigation under federal law or a state constitution might be available to challenge a state disenfranchisement statute. Also, a legislative campaign could be mounted for amendment or repeal of the state statute. Although repeals are difficult, some recent progress has been made in this area. Wyoming recently repealed a blanket permanent disenfranchisement law and now permits non-violent offenders to apply for restoration of their voting rights five years after completing their sentence. In closing, Jessie Allen, associate counsel at the Brennan Center, specifically discussed the Project’s initiative in Florida, where a quarter of black men are disenfranchised, making it the state in greatest need of reform. The Brennan Center considered two alternate approaches in litigation. The first was to make an Equal Protection claim based on intentional discrimination; the second would challenge the laws through the VRA, arguing that when race plus this voting “qualification” are factored in, states end up with a prohibited inequality of opportunity.